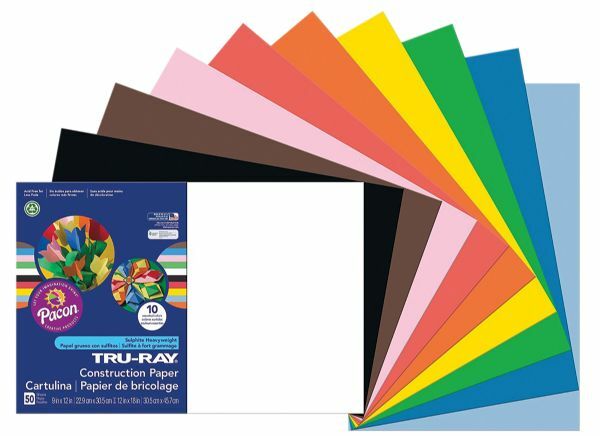 Pacon® Tru-Ray® Construction Paper Assorted Colors 12" X 18"
Heavyweight 100% vat-dyed sulphite with longer stronger fibers. * Tru-Ray Construction Paper is tough enough to take scoring folding and curling without cracking and tearing. * Its superior fade-resistance keeps projects brighter and fresher longer. * Acid free for less fade. * 50% recycled fiber content and recyclable. * Standard Assorted package contains 10 colors: Black Blue Dark Brown Festive Green Orange Pink Red Sky Blue White and Yellow. 18" x 12" x 0.38"